This entry was posted in expectations, family, respect, sharing, stress on 1 December 2018 by Martina. 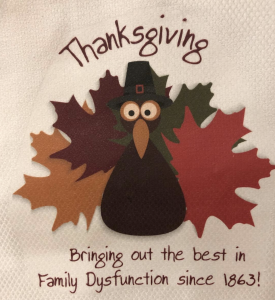 Now, not every family is dysfunctional, of course, because every experience of family is highly individual. What may appear to be “bad” to someone else, is “normal” or even fun to the person experiencing it. I’ve heard stories of yelling, fights, and behavior that would lead an outsider to believe that everybody hates everybody – when the reverse is actually true. Then I’ve heard stories of happy peaceful dinners, where after the fact everyone goes home and breathes a sigh of relief to no longer be in the company of their relatives. The bottom line is: There is no “right” way to be family (despite what the Hallmark Channel wants us to believe). How you personally define “family” is what matters. The traditional definition of family (from Dictionary.com) uses the phrase “a social unit,” and I think this most accurately describes what family means: It’s a unit. In our life, we can have more than one “family” unit. There are work families, friend families, church families, fitness families, etc. In my experience, though, I’ve come to learn that we all have two specific families: family of “blood” and family of the heart. Every social unit in our life falls into one of these two categories, and for some, the family of blood is also the family of the heart. But whether it’s our fitness family, church family, friend family, work family (etc. ), all of these “families of the heart” have one thing in common: relationship. Relationships are connections that we make based on something shared and require mutual investment, maintenance, and commonality. In our family of blood, we have shared DNA (in the case of adoption, it’s the bond that is shared). And yet, shared DNA (on its own) is not enough to sustain a relationship. 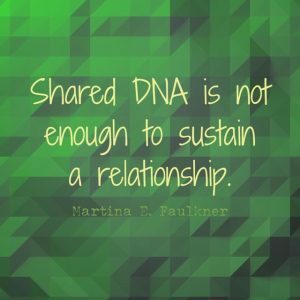 This is why we see so many fights or dysfunction around traditional family gatherings: the assumption that shared DNA, alone, is a relationship. It’s not. That would be like saying a shared cubicle wall is a relationship. It’s circumstantial. Every healthy relationship requires nurturing, mutual respect and investment, as well as a genuine interest in each other. The circumstances upon which two people are brought together (such as shared DNA or an office wall) are not enough on their own to create a healthy relationship. They’re the cause for coming together, but it’s what happens after that makes the difference. What transforms shared DNA (family of blood) into relationship (family of the heart) are all the little, consistent, and thoughtful things that we would do in any other social situation in which we want to build connection with another human being… and it requires reciprocity. Without reciprocity, it’s not a relationship, and no shared biology can overcome that. So, as we spend the next month gathering, sharing stories, and possibly feeling less connected than we think we “should” (darn those Hallmark movies! ), perhaps it’s a good time to let yourself off the hook and remember a simple truth: shared genetics is not a reason to expect relationship and connection. Unless both parties are invested, it can become an exercise in frustration (as all the stereotyped products have shown us). However you define “family” is up to you. For me, I think of it as people who have my back, and know that I have their’s, regardless of whether we share any biology.